Super Soft Clean Shopper Discounts Apply ! A great baby shower gift, baby's first Christmas - or a gift for new mom! The Super-Soft Clean Shopper is 40% fluffier than the original Clean Shopper shopping cart cover. 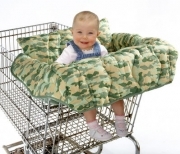 Complete with safety strap, toy loops, pockets and a convenient carrying tote, this is a favorite shopping cart cover of many moms!